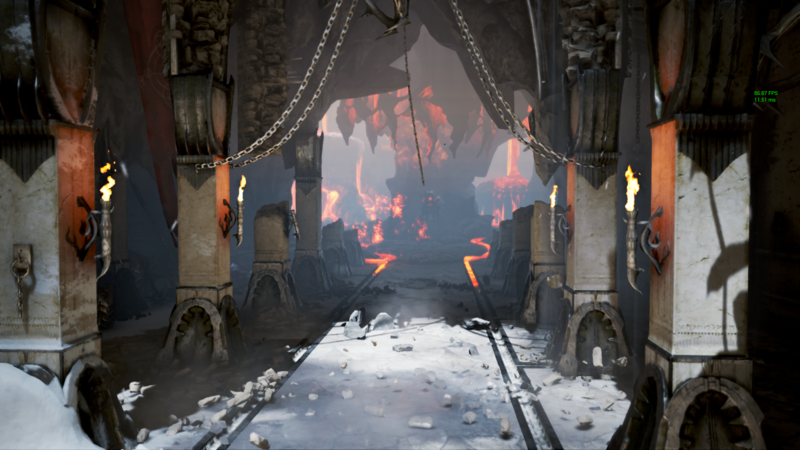 This Unreal Engine 4 demo shows the engine's capabilities using DirectX 11 with demanding particle effects. Before running the demo you might have to install the (included) Microsoft Visual C++ Redist Runtimes. Settings can be edited using the included batch file (e.g. ResolutionSizeX=1920; ResolutionSizeY=1080). The newest UE4 version supports DirectX12, keep in mind that the dx12 is still in development. Video after the break. Why does it request net access? Edit: Oh, ones a video, the others the download link. Ironically, it runs much better under DX11 than DX12 for me. I guess the technology is still immature. Or whatever your rez is? Looks bad quality compared to mine, is that the DX12 or 11 one? it's the dx12 and no vsync one. The performance was fine. It's the visuals I wasn't impressed with. Some textures look horrible. Like XBox 360 textures. Anyone looked at CPU utilization to see if DX12 is actually working properly? 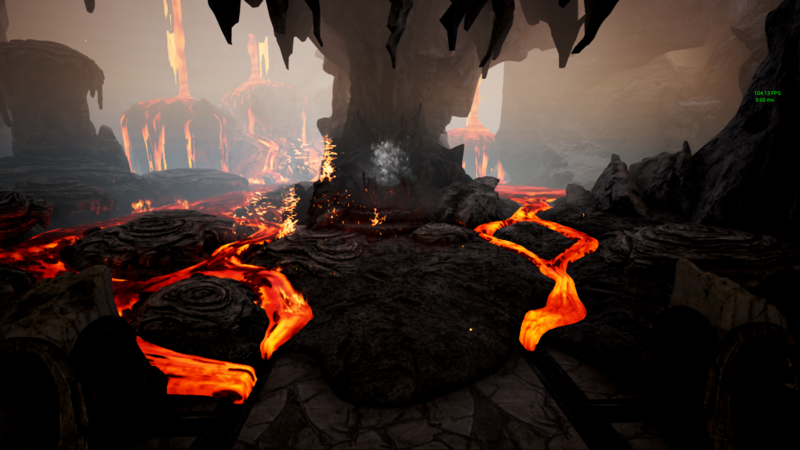 Unreal Engine 4 is certainly capable of much better than what the Elemental demo provides that's for sure, it's a few years old now afterall. Epic did mention that DX12 would be available from version 4.9 of UE4 which is still being worked on. The new Unreal Tournament will be using it 4.9/DX12 as soon as it's available. I think you can run the benchmark in DX11 (if you run the main application icon), or in DX12 if you run the link marked "DX12". It runs OK on my laptop - I got an average of 40fps as recorded by FRAPS using DX11, with minimum fps in the high 20's. Running the DX12 version seemed to be the same fps (FRAPS wouldn't run with DX12), except overall power draw was probably on average 5W less as measured by my Kill-A-Watt - I think this was because I was getting 99% constant GPU utilisation during DX11, and during DX12 I was getting slightly less at 97% constant GPU utilisation, CPU utilisation seemed to be similar between the two versions strangely, although did look that DX12 CPU utilisation only very slightly more evenly distributed between cores. VRAM usage on DX12 was 700MB higher than DX11. Both DX11 & DX12 versions looked the same, so I don't think they're running different settings. All a bit MEH, but happy that the DX12 demo ran well on my laptop regardless! Maybe it will be possible to combine "A Boy and His Kite" with UE4.9 once it's out of testing, should be a better test. Downside to that is that the showcase version of that particular demo is a full 50 GB. This demo is a terrible example of UE4. The new unreal tournament pre alpha has much much better graphic and it runs 3 times better than this mess, and its an actual game where stuff happens, not just a demo, where nothing is happening. DX12 is awful in this...stuttering and poor FPS. It worked pretty well on my aging 680/920 combo, except for the rift formation at the end, where it dropped <30 fps. And the most of performance bottlenecks are related to the extensive use of extra shiny effects, where it would be enough just to pack better textures for clearly visible objects, and make them behave naturally. Worked perfectly fine for me when I ran it at the higher res of 2560x1600. My titan X loved it! Was expecting a lot more from DX12. Thanks Unreal. DX11 was smooth all the way through CPU utilization was around 20-22% mostly on a single core but had glare issues where the textures was corrupt. DX12 ran ok but was a little slower gone from around 55fps to 50 average and 700MB more memory used, the strange thing with DX12 was the odd stutter where fps gone from 50fps down to 10fps just for a second before returning to normal happened in 5 parts of the demo, MSI after burner show utilization dropping and same with the clock speeds, it's not over heating either. CPU utilization was average of 8% total spread mostly across 4 cores with threads only being uses a little. There not a massive amount of diff in the two, glare problems was not experienced in DX12 and there was steam off the **** with heat waves and significantly more smoke and debris, textures remained the same. This was at 2560x1080p, DX12 used slightly less around 97% temps for the GPU was 83C, DX11 used 99% and temps gone up to 89C, fan speed increased alot more in DX11 indicating the GPU was put under more pressure since it had higher utilization and clock speed remained stable since there was no stutters, there was 6 parts in the demo where it stuttered in DX12 and the clock speeds drop for a second there. Its just some guru3d user who ported it to DX12 with few minor tweaks, overall its still same old DX11 elemental demo. And I see he used too much bokeh DOF by some parts, not really a fan of that because it glitches main character helmet (horns) when he stands up..
RTSS is capping FPS in the "DX12 version". I didn't notice that before.